This collection of dreamy quilts bursts with fabrics from the scrap basket! 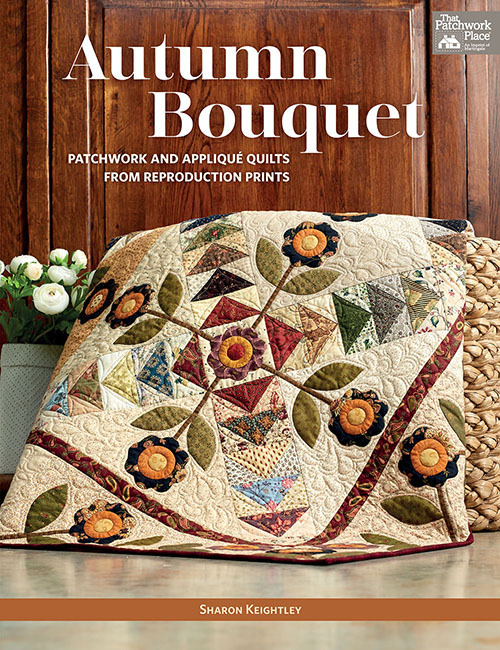 Classic patchwork provides a backdrop for pretty flowers and twining vines, all made easy with machine-applique. Learn two ways to prepare appliques, plus tips and tricks for setting up your machine for applique. Dozens of close-up photos and tips reveal secrets for mingling antique-style fabrics ranging from blushing pinks and soft purples to rich golds, reds, and browns. 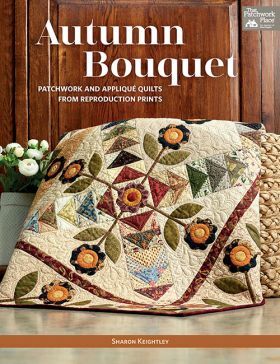 From small wall quilts to lap-sized designs, this bouquet of quilts is simple to sew--yet so extraordinary, the quilts you make will be handed down from generation to generation. Sharon grew up in a family of makers in rural New Zealand, where sewing days were special and very dear to her heart. Her mother was a dressmaker by trade, who could make anything. Sharon would often see an outfit in a magazine, and her mother would end up making it for her. Sharon's grandmother, also a maker, taught her the arts of knitting and crochet. All of this early introduction to the world of fabric and threads led Sharon to who she is today. As a mother of two grown sons and wife of a busy man living on a small farm overlooking New Zealand's Kaipara Harbour, she has time to create quilt designs that express her love of vintage and reproduction fabrics.